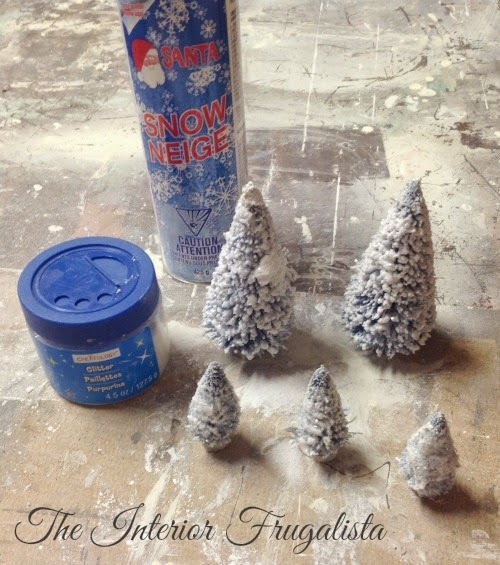 Hello everyone, I am Marie from The Interior Frugalista, a blog about all things DIY around our humble abode. I’ve enjoyed following BeBetsy for about a year now and I’m thrilled and excited for the opportunity to guest post for Sharon and Denise. 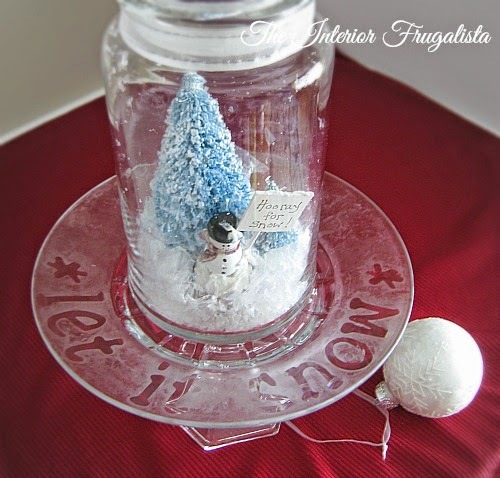 With holiday decorating in full swing I thought I’d share an easy and thrifty Holiday Diorama Jar Craft with you today. Pretty much everything you need can be found at the Dollar Store, thrift store and around your home. I did the Happy Dance when I saw these on the thrift store shelf because the Dollar Store didn’t have their Christmas stuff out yet. My favorite style to decorate a holiday mantle is a Frosty Winter Theme. I wanted this display to sparkle and reflect light, hence the reason for using glass, glitter, and a lot of white. So are you ready to have some fun! Spray paint the house with white spray paint (I used Blossom White because that’s what I had on hand). 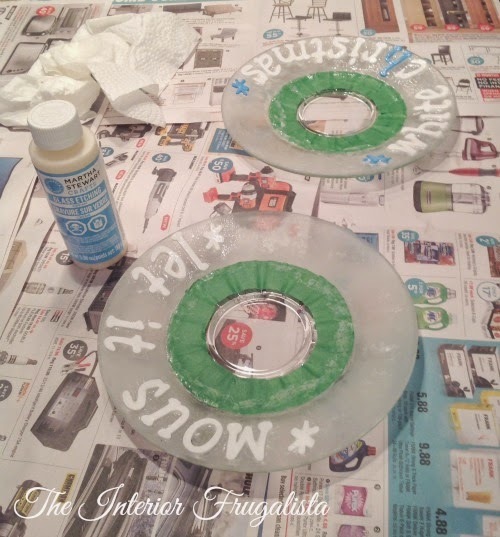 After the paint dries brush Modge Podge onto the roof and sprinkle white glitter, shaking off the excess. To keep your work space glitter free work over a plastic container to catch the excess and pour it back into the container to reuse. Waste not want not! 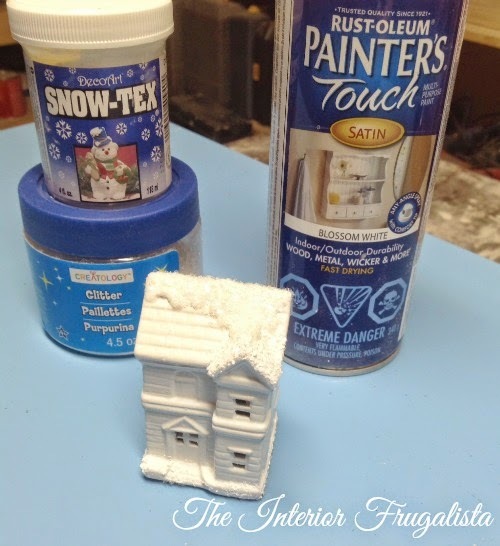 I brushed a thick layer of Snow Tex along the base of the house and sprinkled white glitter over it for an added affect (although once the faux snow was added to the jar you couldn’t see much of it so avoid this step if you want). 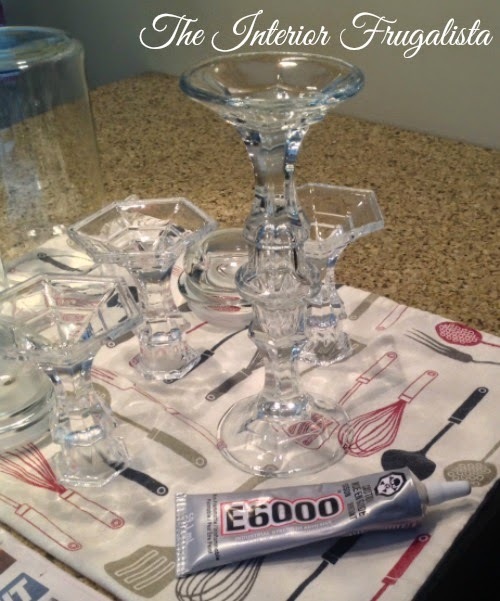 Glue two candlesticks together top-to-top using E6000 glue. This will be your tallest diorama in the trio. While that was drying I prepped the glass plates for frosting etching. 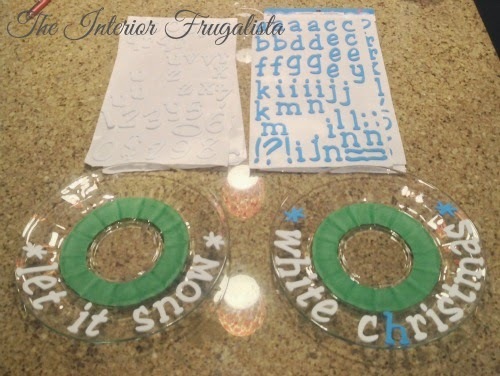 Using self-adhesive letters I created the phrase “Let It Snow” and “White Christmas” around the rim of the plates. Really give them a good rub to ensure they are tightly secured to the plates. I wanted the middle of my plates to remain clear so I cut pieces of painters tape to protect that portion of the glass. Wearing rubber gloves coat the rim of the glass with Etching Creme using the brush provided. Apply it in a thick layer and make sure you completely cover the area around each letter. I swirled the brush in a circular motion and let it sit for 30 minutes. The package directions say 10 minutes but I wanted a noticeable contrast between the frost and clear glass so the words would be highly visible. Rinse the plates under the tap with warm water until all the creme is removed and then gently remove the stencils and painters tape. After the plates have dried turn them upside down along with the candy dish and glue the top of the candlesticks onto the plates with E6000 glue and let them cure for several hours. While the plates were curing I cut a small branch into several slices using the mitre saw. Glue the miniatures and trees to the wood slices. 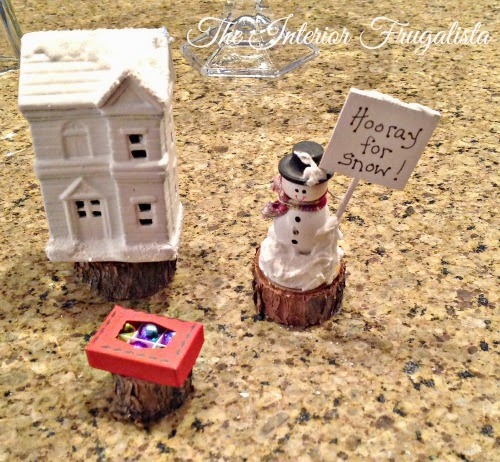 This raises them up to accommodate the layer of faux snow. You don’t have to use tree branches, white plastic bottle lids would work too. Now comes the fun part – decorating the dioramas! Again using E6000 glue attach the ornaments to the base of the jars. After the glue cures (I left mine over night) sprinkle faux snow into each jar. I found it helpful to use a wooden skewer to move the snow around to cover the wood slices. Fill the candy dish with water and add the floating candles. 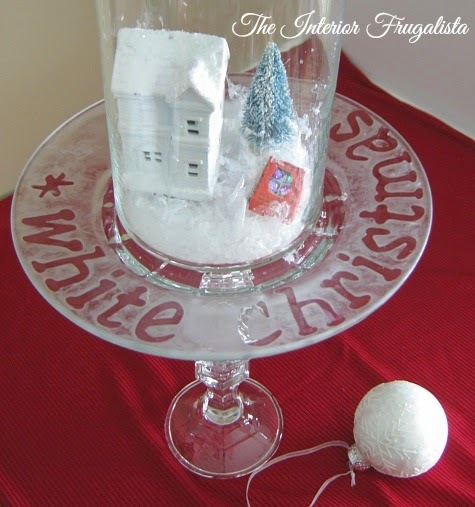 And there you have it, a pretty yet inexpensive Frosty Winter Wonderland vignette for a fireplace mantle, sideboard, dresser, or table top. I hope you enjoyed this tutorial and that it inspired you to create some for your home! If you have any questions, leave them here in the comment section and I’ll be happy to answer them.